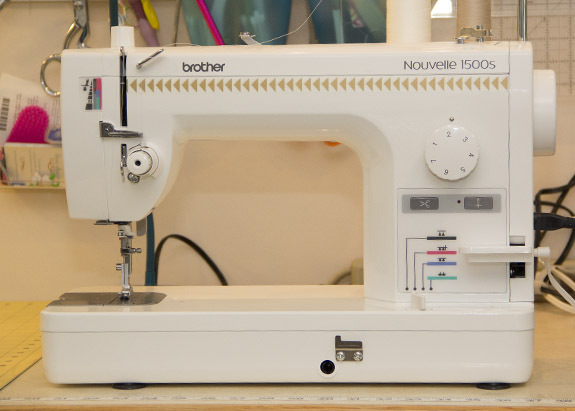 from the blue chair: A new sewing machine! I bought a new machine! After the disaster with my old machine, I finally invested in a new one. I debated and held out as long as I could, but even though I'm sewing less, I really couldn't be without a functional machine. 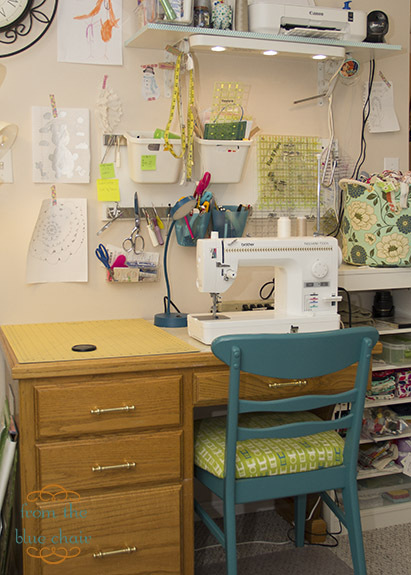 This is my tiny little sewing space where my machine lives. It's nothing fancy or perfectly decorated, but my kiddos do create all sorts of drawings and switch out my artwork every now and then. I was looking for some fairly specific items with the new machine. When I purchased my previous machine, I had only been quilting for about six months. I knew I wanted to stick with quilting for a while and wanted something that would make this hobby easier, but I didn't really understand exactly what I wanted or needed from a sewing machine. After six years of quilting, I'm much more clear about what I need and what I don't need. I needed it to be fast. I can fmq fairly fast. I was constantly frustrated with my last machine because I could quilt faster than it could. I wanted it to be sturdy and solid. I didn't care about a computerized machine. I didn't want any fancy stitches. On my old machine I only used straight stitch and zig-zag. Fancy stitches aren't my style. I needed it to be able to handle heavy fabrics. I needed it to quilt well. 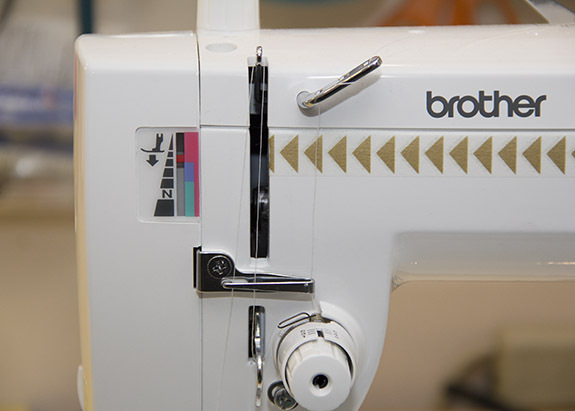 I knew I wanted a straight-stitch machine. I still have my very first machine, and while small, it is a great back-up for zig-zag when I need it. I also have a serger for finishing edges when needed. I knew a straight-stitch would meet my sewing needs 95% of the time. Because I have these other two back-up machines, I knew they would fill that extra 5% when a straight-stitch wasn't adequate. I narrowed my search to the Juki 2010Q and the Brother 1500S. They are essentially the same machine. They look nearly identical, and I've been told by a couple people in the industry that many of their parts are manufactured in the exact same place. There are two main differences. the Juki has speed control while the Brother does not, and the Juki costs an extra $400 coming in at around $1000. The Juki definitely has a following and everyone swears by theirs. The Brother obviously sells fewer machines as there is less of a following, but everyone I know who has one loves it. I ultimately went with the Brother. Basically, speed control wasn't a deal breaker, and it wasn't worth $400 to me. Price was a big factor for me this time around because prior to a small person pushing my old sewing machine off my desk and breaking it, I wasn't planning for this purchase. After sewing on my machine for a couple months, I love it. It's fast, sturdy, sews through leather an vinyl without any problem at all, and it quilts wonderfully. The tension tends to be a bit finicky. I'm constantly having to adjust it, and this has taken some getting used to since my last machine was fully computerized and did all the thinking for me. I love the pressure foot adjustment. I didn't have this option on my last machine, and it's wonderful to be able to adjust how fabric feeds with this feature. I also really like the pin feeding system. Basically, a pin pops up from the bottom while sewing to help heavier fabrics like leather and velvet through the machine. Overall I'm completely happy with my new machine. It is a pain to pull out another machine when a straight-stitch won't do, but generally it meets my needs perfectly. I'm a bit sad I didn't realize what I needed when I bought my "nicer" machine six years ago. It was nearly triple the price and had so many extras I never used. Hopefully, this one sticks around for many years. Yeah you! 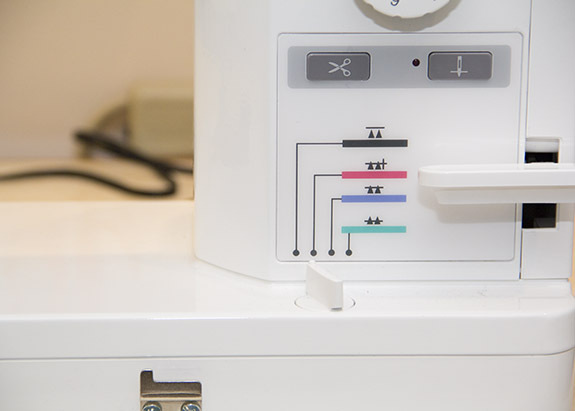 Hopefully a new machine means you will be quilting more than you thought you would. I love your work! Earlier this year I bought a Babylock that looks just like this machine! But I love it for quilting. And I do have to fiddle with the tension a bit too. Enjoy!! I am very interested in this machine as the Brother machines seem easier for me to find locally. I am glad you like it. Thanks for this info, Kati! I've been thinking about selling my machine (because it has tons of features I don't use, and I'm not completely happy with it even though it cost a lot of money). I've been thinking about a Juki, so this comparison is very helpful! I love the flying geese decals!! Did it come like that or did you add them? Congrats on the new purchase! I'm with you. All the bells and whistles are wasted on me! This is exactly the thought process I've gone through and I came to the same conclusion last week! Still need to buy it, just waiting for my hubby to get back from his work trip at the end of the month, but I'll be getting this one too. It's been a bit harder because I've had to do all this in Japanese and trying to compare the models they have here to what everyone else has, but I'm very excited to hear that someone else has come to the same conclusion, lol! Congratulations on your new machine. I've also been considering 'downgrading'. I have a fancy (expensive!) machine with lots of bells and whistles that I never use. The Brother and the Juki were my first thoughts and I do wish I'd stuck with those but let myself be talked into fancy. I have used it for years as my main machine while my fancy janome sits in the closet :) I love the knee lift! I have this machine too, and agree with everything you mentioned - even the fiddly tension! I hope you continue to enjoy it!